Their camper isn’t a big Lance or Arctic Fox camper with a slide-out that requires a dually diesel one-ton truck to lug it around. 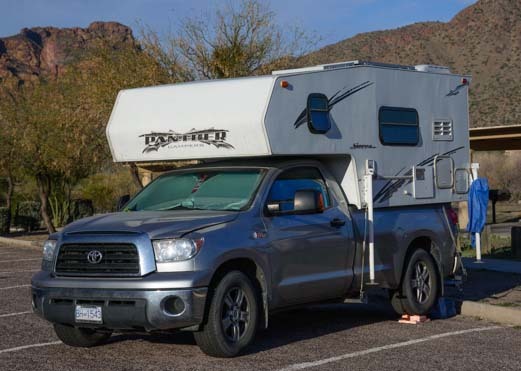 They live in a tiny pickup camper that sits in the bed of a Toyota Tundra half-ton pickup. 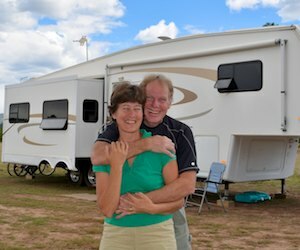 They have lived in this rig full-time for two years, and they don’t show any signs of wanting to upgrade. “We can camp anywhere!” Ruth told me with a smile. These guys aren’t the only folks we’ve met in a tiny rig. Years ago we met a very happy couple that had been living in a popup tent trailer for four years. So if your dream is to go have a full-time RVing adventure, don’t let your dream slip away just because you can’t afford a big fancy rig!! Not long after this fun encounter with Ruth and Randy, we came across the most unusual hippy style car. It was painted up in all kinds of bright colors and looked for all the world like a groovy-mobile from the 1960’s. If you got up close, however, the stylized paintings were icons from decades later. 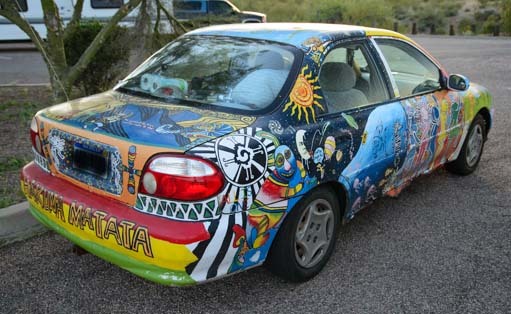 “Hakuna Matata” was painted on the back end of the car and the New Age mantra “You create your own reality” was painted on the front. Nemo and a clown fish friend of his were swimming near the sea anenomes on one side of the car, and a group that resembled the Teenage Mutant Ninja Turtles was on the other side. The hippy era wasn’t completely overlooked, though. 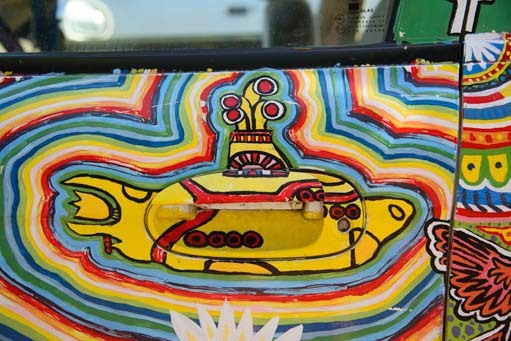 The door handle was painted with an image of a yellow submarine. While hiking a few minutes before we spotted the car, we had passed a very attractive young gal on the trail carrying a tent and overnight gear. 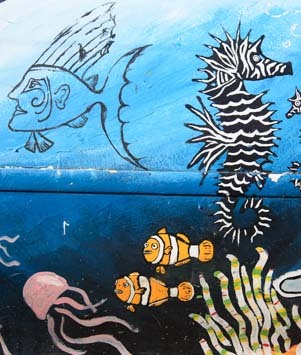 …Just certain parts, like this yellow submarine. When we looked up the website address she had painted on the car, we discovered the beginnings of the most delightful travel blog. She hadn’t posted anything in over a year, but the few entries she’d made were intriguing. Just 20 years old, she was out living her travel dreams and having some incredible adventures. Unfortunately we never ran into her again. At the opposite end of the spectrum, a trailer pulled up alongside us recently, towed by a Honda Element! It was nearly new, yet was completely retro in design. 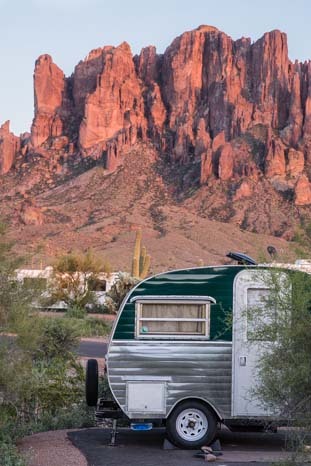 It was a snowbird rig, not a full-timing one, and the owner Pete was having a blast camping in it for three to four months each year in Arizona to escape the snowy Pennsylvania winters. Rather than “look” retro, why not revive the real thing? The trailer manufacturer has made just a few of these special retro trailers, and Pete’s was unique because he had gone fully retro with jalousie windows and other “throw-back” features. One day while out on our bikes we bumped into an antique looking rig that truly was an antique! 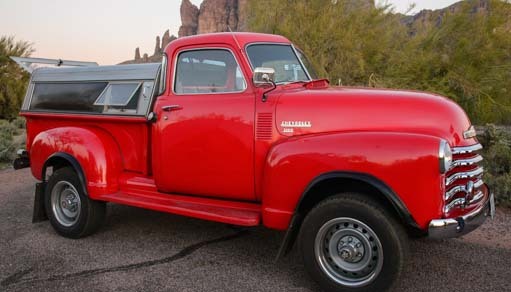 It was a 1950 Streamline trailer that was paired with a fire engine red 1950 truck. 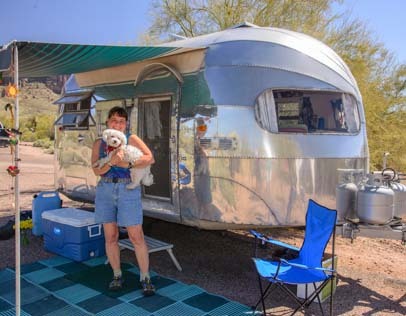 The owner, Patty, explained that she and her husband Jim were 1950 vintage too, so they were all the same year’s models! Patty says she and Jim at 1950 vintage too! When Jim first spotted the trailer, he eyed it up for a year before he bought it. Then he worked on it for six months, all day every day, to bring it back to life. And what a charmer it is, both inside and out. 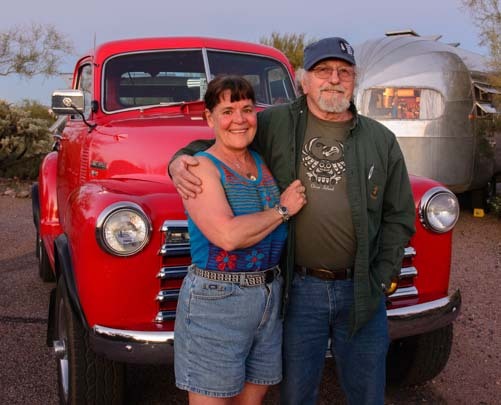 He upgraded the truck to have many modern conveniences, includng converting it to four wheel drive, installing hydraulic disk brakes, fuel injection, tilt steering and air conditioning. If you’ve got an antique trailer, you gotta have an antique truck to pull it! Now that is a labor of love!! It’s not a full-time rig, but what a blast for vacations and weekends! This tent-on-a-trailer setup reminded us of the antique tent trailers we saw at the “Road Back in Time” museum exhibit at the RV/MH Hall of Fame Museum in Elkhart, Indiana, a few years ago. 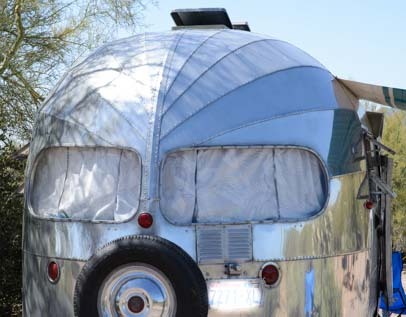 The 1916 Cozy Tent Trailer and the 1932 Gilkie Kamp King Tent Trailer (scroll about halfway down the page at that link) weren’t too different than this modern one, although the 1916 rig did have wooden spoke wheels!! So there are lots of ways to get out and see a bit of the world while taking your home with you. Whether you’re going for a few weeks or a few years, there are many different rigs that will take you in style (or at least take you! ), and if you want the dream badly enough, your rig doesn’t have to break the bank! !